The September 19 episode of Eat Bulaga got 43.1%, making it the highest TV rating so far for 2015. This featured the first date of Alden Richards and Yaya Dub (left frame). 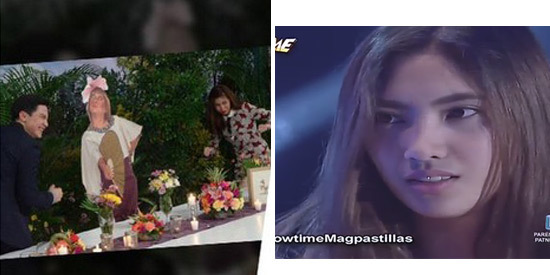 On this day, It’s Showtime got a TV rating of 10.7% when Pastillas Girl (Angelica Jane Yap, right frame) confronted her ex-boyfriend. Here are the highlights of the comparative ratings of GMA-7, ABS-CBN and TV5 programs from September 19-20, 2015, according to AGB Nielsen Philippines’ survey among Mega Manila households. Eat Bulaga! reached another milestone in the ratings history for 2015. Its September 19 episode, which featured Alden Richards and Maine Mendoza’s first date, got 43.1%, now the highest rating so far for 2015. Eat Bulaga!’s airtime rival, ABS-CBN’s It’s Showtime only got 10.7%. In this episode, Pastillas Girl (real name: Angelica Jane Yap) confronted her ex-boyfriend. A new show also debuted on September 19. Titled Celebri TV, it is the replacement for the two-decade-old showbiz talk show, Startalk. Celebri TV features Joey de Leon, Lolit Solis, and Ai-Ai delas Alas as the main hosts. The pilot episode of Celebri TV scored a TV rating of 17.6%, beating Failon Ngayon’s 4.6%. In contrast, the final episode of Startalk got 12.7%. The Kapuso network also won Saturday primetime. The top two shows were Magpakailanman and Pepito Manaloto. The Magpakailanman episode, which featured comedian Boobay, got 28.7%. It beat Maalaala Mo Kaya’s TV rating of 17% when it depicted the story of three boys (portrayed by Neil Coleta, John Manalo and Nathan Lopez) who were kidnapped by a rebel group. September 20, Sunday, was also a victory for GMA-7. Sunday Pinasaya was No. 1 on daytime with its TV rating of 23.2%. It outpaced ASAP’s second London episode that registered 9.5% in Mega Manila. Kapuso Mo, Jessica Soho was the leader on Sunday primetime with 28.6%. Here are comparative ratings of GMA-7, ABS-CBN and TV5 programs from September 19-20, 2015, according to AGB Nielsen Philippines’ survey among Mega Manila households.